This robot is equipped with a Dosatron. This water-powered proportional dosing pump makes sure you always spray with the correct dosis of pesticide. Easy to spray small areas and a minimal waste water. The tank mixer detects when it is nearly empty. The tank can be taken off very easily for changing or cleaning. 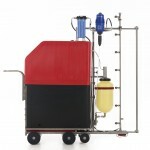 The Dosatron and tank are attached to the front of the machine, between the sprayboom and the robot. In this way our robot is still only 30cm wide! The Dosatron is also available for the current S55; your S55 spray robot can easily be equipped with the Dosatron.